TOPIC: a kind soul helping an absolute newbie? ....however this is where my understanding of everything leaves me. I open the game I am playing ( FF14 ) and try to open Reshade, but shift + F2 doesn't seem to work ( for the record my keyboard is European maybe that is the problem ? ) I am also not sure which keyboard to use - the one from my laptop, or my USB keyboard, connected to the PS4? I know this must sound so stupid & I guess the solution is probably easy as hell .3. but please consider, I play for less than a year and never touched any games before ! I am really, an absolute newbie ! Install ReShade to the game, not whatever that program is. long story short: it won't work. period. a game has to be rendered on the local machine for reshade to have access to the rendering data. 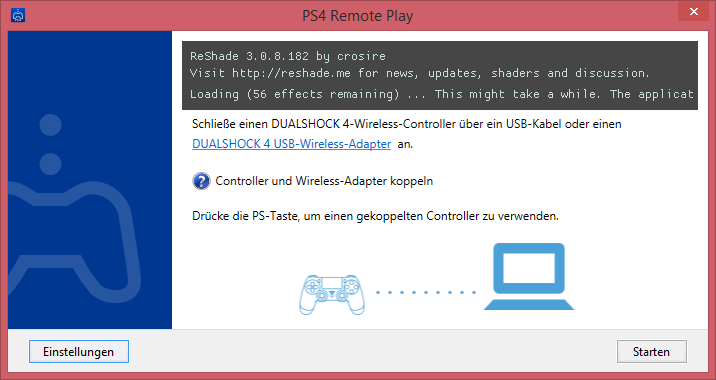 what you're getting with ps4 remote play is exactly what the name suggests - remote play. games are being rendered on your console, then streamed to the pc. you would have to play a pc version of FF14, that's the only way to use reshade. that particular game doesn't have a perfect compatibility, so some effects may not work - hard to tell without actually testing it.